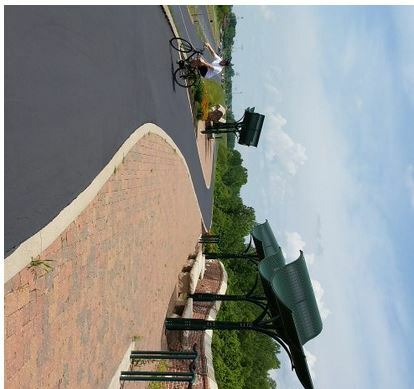 The Monarch Levee Trail in Chesterfield offers easy access to the Katy Trail via the highway 64/40 pedestrian bridge. There is ample parking, as well as food, bike rental, restrooms, and general shopping options. Scroll down for a map of the Monarch Levee Trail, the Highway 64 bike/pedestrian bridge, and how it connects to the Katy Trail. 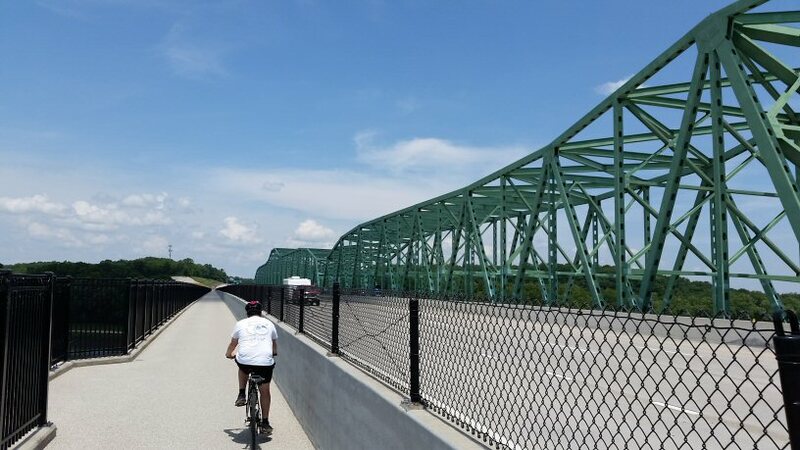 The bike and pedestrian bridge across the Missouri River is completely separated from car traffic, similar to the bridges in Jefferson City, Hermann, and the Page/360 bridge just downriver. There are a couple spots on the bridge where you can pull aside to enjoy the magnifient river views. On the Katy Trail side, you'll drop from bridge level to river level (or climb back up) by riding a large circular "cloverleaf". It's about 1/3 mile around the cloverleaf, so the grade is gradual enough that climbing is no worse than a mid-grade hill. And it's loads of fun going down! This puts you on the Katy Trail at mile 51.3. This asphalt trail runs along the top of a levee for nearly 8 miles, with the Missouri River just behind the treeline. 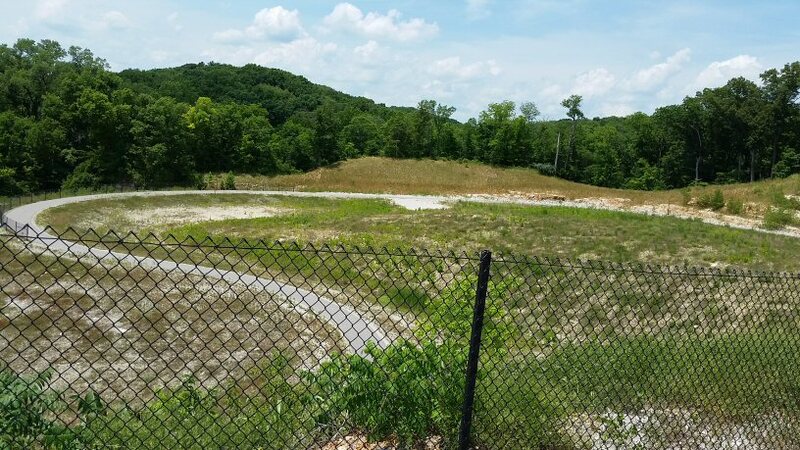 From the highway 40 bridge, the trail extends nearly five miles to the east, ending next to Top Golf and just past Chesterfield Outlets. A sign at the end of the trail indicates plans for future expansion. 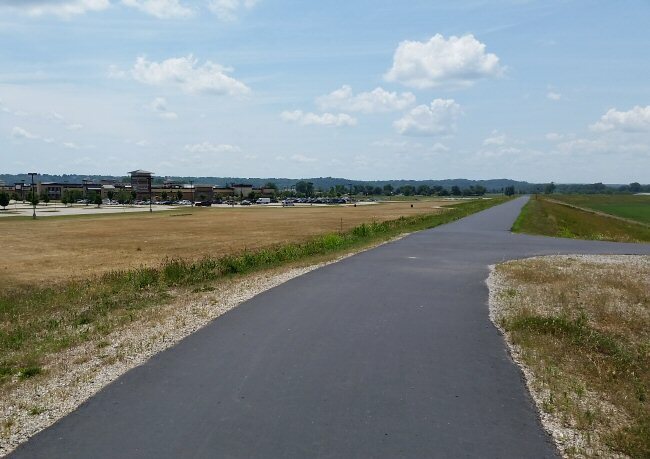 To the west, the Monarch Levee trail continues to Centaur Road, which is three miles from the Highway 64/40 Bridge. Bike rentals and great food are available at the Bike Stop Cafe, located at #140 in the Chesterfield Outlets mall. They also offer shuttle services. Bike Stop is located near the middle of the mall, right by the food court and across from Gap Outlet and Yankee Candles. Park at the northern end of the mall's parking lots - the side of the mall where you'll see the Calvin Klein sign. A small path connects to the trail. There is plenty of parking available at either far end of the mall's parking lot. The lot on the east end, between Club Fitness and Top Golf, puts you close to the eastern end of the trail. On the west end of the mall, the parking gets you close to River's Edge Park, which has gravel trails. Photo: coming off the highway 64 bridge. St Louis Premium Outlets is to the left, the west end of Monarch Levee Trail is straight ahead, and the right turn heads under the bridge and on to the east end of the trail. Mall shopping and trail riding don't usually go together, but The Monarch Levee trail runs right past the St Louis area's two main outlet malls. Maybe you don't want to buy a new outfit while out for a trail ride, but having the malls nearby can be handy - for example, if you are on a multi-day Katy Trail ride and need to get an extra pair of athletic socks from the Nike Outlet, or swing by Sunglass Hut to replace a pair of shades. Both malls welcome cyclists parking on the outer edges of their lots, near the trail. And both malls hope you'll drop in and spend some money. St Louis Premium Outlet Mall is near the middle of the trail and close to the bridge. Chesterfield Outlets at the east end of the trail. Across the highway from Chesterfield Outlets is the Chesterfield Valley shopping area, with every retailer and chain restaurant imaginable. However, the roads on that side of highway 64/40 have very heavy car traffic and are not bike-friendly at all. We suggest you do your shopping and eating at the outlet malls. Your opinion counts! 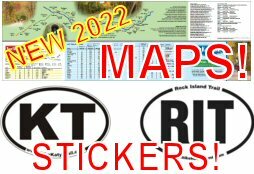 Click here to add your comment on the Monarch Levee Trail and/or Highway 64/40 Missouri River Crossing, or click Read/Reply to add your reply to the discussion listed below. Or view all comments for the whole trail.